You wouldn’t think a commercial fisherman would know much about slipforming, unless you’ve met Greg Brock. Brock quickly discovered that the rewards of concrete work were, for lack of a better word, concrete. “It’s a little more rewarding than catching fish. You could actually see the things you build,” he says. Brock began attending the World of Concrete and became fascinated by curb machines. Seeing the value the equipment could add to his business, Greg knew someday he wanted to own his own machine. Greg recently bought a used 2006 5700-Super-B from a retiring contractor on the east coast. The machine arrived during a pre-construction meeting, where several large roadbuilding companies were in attendance. As proud of his new purchase as Greg was, there was only one problem. Once Greg had his machine unloaded, he realized he would need factory training to be able to make the most of the capabilities of the Super-B on the job. 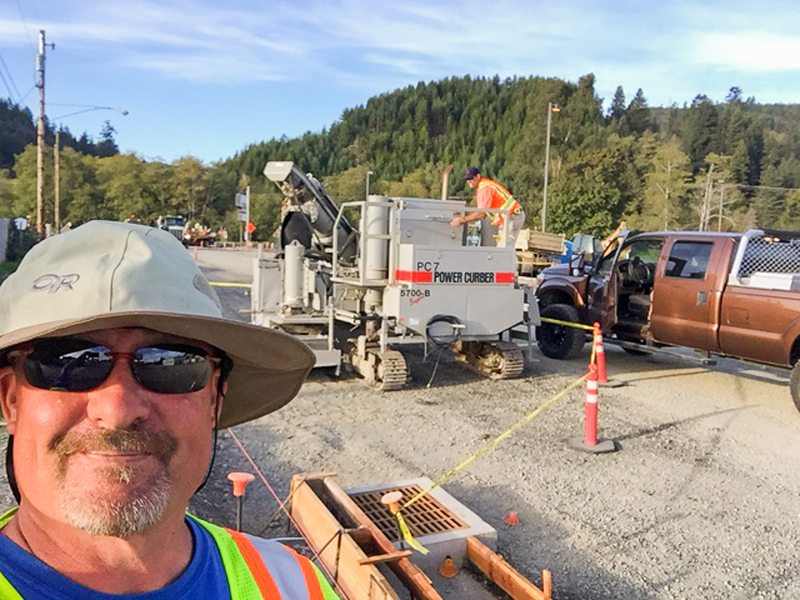 Power Curbers’ Regional Service Manager Terry Duncan traveled to Oregon to train Greg and the Brock Construction crew. “Terry worked with my crew to learn the big picture and the little nuances – stringline, the way the machine is set up, different ways you can put the sensors. And instantly, I was very confident. My worries were gone,” says Greg. Even Greg’s ready-mix provider was impressed.